It is red, grey and white in color. ( HD / U2D / 9048119 ) (18). 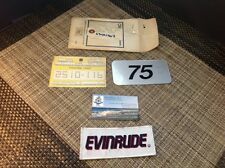 210342 EVINRUDE DECAL NOS CN-13. Shipped with USPS First Class Package. 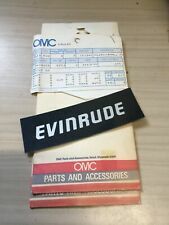 210342 EVINRUDE DECAL NOS CN-13. THIS ITEM IS BEING SOLD FORNORTHERN LAKES MARINE LLC. It has a part number of 008553. It is gold with white outlining in color. Canceled Orders and Order Changes . We are full Service Arctic Cat Dealer. Here is a NEW / NOS OMC 70 HP VRO Outdrive Sticker Decal Full Kit in box. 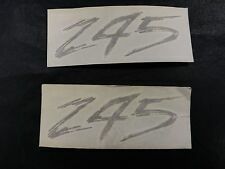 The longest decal (the one that says VRO on it) is about 58" long and has 2 part #'s on it, well I think they are part #'s, they look to be: 115922944 and 211173X. It is gold with white outlining in color. Canceled Orders and Order Changes . Most of our inventory is new unless noted otherwise. Mike: 630-918-823four. Steve: 228-365-023zero. Part number 341767. OMC OEM factory part. Was discontinued in 2007. Background is smoke black. 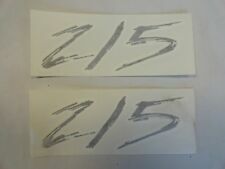 "18" is white/gray outlined in silver. "Johnson" is printed black in a red stripe. There is a third red stripe below Johnson. It is purple with white outlining in color. Canceled Orders and Order Changes .